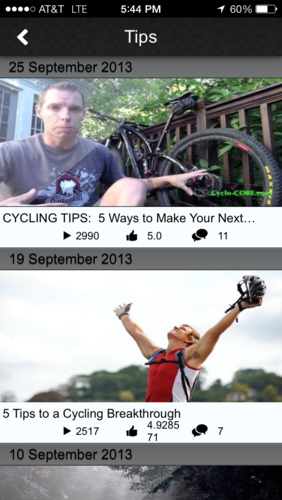 The iCyclo App is all about bringing you top of the line cycling and triathlon training tips, workouts, podcasts, gear reviews and more–right to your phone, iPad, or other mobile device. 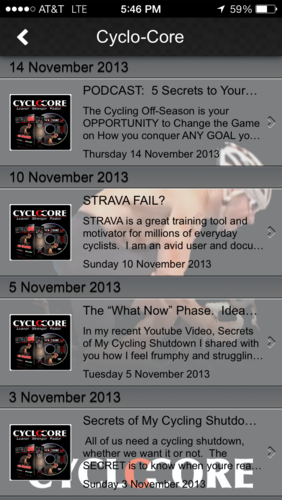 Like a cycling personal trainer in your pocket, Graeme Street, recognized cycling fitness expert and owner of Cyclo-CORE.com will be updating new cycling and triathlon related info for you EVERYDAY in the App, so come back often for more. -Weekly Youtube Video Podcasts, Tips, and Training Expertise. 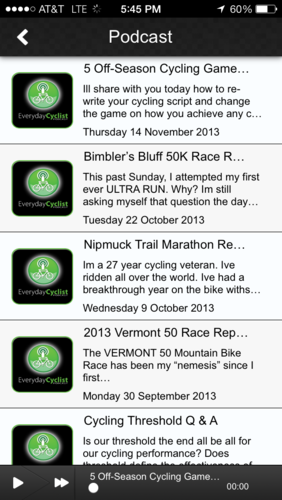 -Weekly Podcasts from Everyday Cyclist Podcast. -Connect to thousands of other Cyclists and triathletes through our FB, twitter, and RSS feed and CYCLO90 Challenge where you can WINweekly prizes for sharing info about YOUR TRAINING. -Get One-on-One Guidance for Your Cycling through the MyCyclo feature on the iCyclo App where Graeme himself will evaluate your cycling needs and make recommendations and suggestions to help you achieve your goal. iCyclo is more than an App–it’s your #1 cycling companion!